Last year's Great North Big Band Jazz Festival was cancelled at the last minute due to snow-bound roads leading to and from Chester le Street. As several bands were facing lengthy journeys in potentially dangerous driving conditions festival director Bill Watson reluctantly took the decision to call the whole thing off. No such concerns this year - just look at the tropical weather! Beginning at eight o'clock on Friday (March 1) with a concert performance by Musicians Unlimited and the Festival Band, the GNBBJF continues throughout the weekend - 11:00am starts Saturday and Sunday! - with the curtain falling early evening on Sunday. No fewer than thirty-two bands will be in competition mode across the weekend vying for a coveted prize. Saturday's non-stop action features senior bands (including several first-rate university outfits) with Newcastle University Jazz Orchestra kicking things off. NUJO, as the band is known, is the only band to have competed at every edition of the GNBBJF. This year's NUJO line-up promises to set a high standard. Band president Tom McDonald and the ebullient sax man Matt Green have been busy knocking the sections into shape with the likes of trumpeter Tom Alcorn and guitarist James Cuxson set to impress the adjudicators. Leeds usually sends a battalion of bands. Not content with one big band, it's an away day for three or four of them. 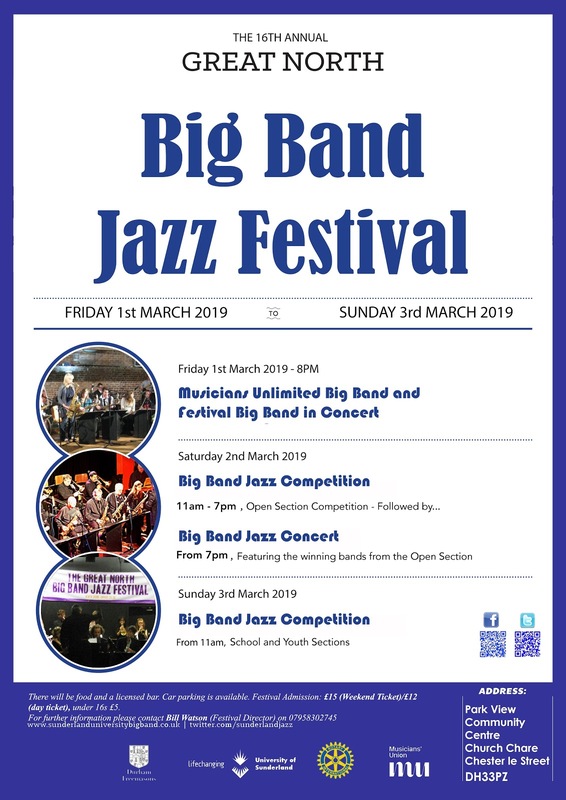 Other Yorkshire-based bands will make the trip, Lancashire is sure to be represented (the Managers Big Band among the ante-post favourites), previous winners Durham University, of course, Dave Hignett's Tyne Valley Big Band will be there (it could be a thirty-strong ensemble!) and, if previous years are anything to go by, there will be a few raiders from the Deep South. Sunday, eleven o'clock it's schools and youth bands. Now then, if you don't shed a tear as a 3'6" tall youngster blows a two-bar solo to rapturous applause you ain't human! Bands from County Durham and the wider region will be joined by others from much further afield (Shropshire has been known to send a decent band or two). It all adds up to a fantastic weekend of big band jazz. The Great North Big Band Jazz Festival takes place at Park View Community Centre on Church Chare in Chester le Street DH3 3PZ. The venue is just off Front Street, take the side street between the PDSDA charity shop and Bon Bons Sweets and Shakes and the entrance is directly in front of you. Frequent buses from and to Durham and Tyneside pick-up and set-down on Front Street. Chester le Street railway station is on the East Coast mainline. The venue is five minutes' walk down the hill from the station. A weekend ticket (available on the door) costs £15, day tickets are available at £12, and under 16s get in for a fiver. The Great North Big Band Jazz Festival is one of the outstanding events in the calendar. If you haven't been to the GNBBJF before, make this the year, you won't regret it!